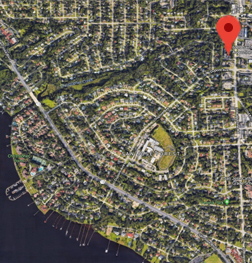 We're conveniently located off the 95.
near the east bank of St. Johns River. Welcome to the McBurney Firm located in Jacksonville, Florida, near the east bank of St. Johns River, south of Jacksonville Landing. The McBurney Firm specializes in the representation of businesses, associations and individuals in the area of business law, commercial litigation, bankruptcy, and homeowner and condominium association law. Click here for further details about the legal services we provide. Our attorneys have over 50 years of combined legal experience. The firm seeks professional and cost effective solutions to meet our client’s legal needs. We practice before all state of Florida and federal courts including the Bankruptcy Court of the Middle District of Florida. The McBurney Firm combines large firm expertise with small firm personal service. We look forward to assisting you with your legal matters. AV Peer Review Rating by Martindale-Hubbell © shows that a lawyer has reached the height of professional excellence. He or she has usually practiced law for many years and is recognized for the highest levels of skill and integrity. Charles W. McBurney, Jr. is rated AV by Martindale-Hubbell, which is the highest available rating for attorneys.